FALIA REVIEWS: CROSSTAC Lightning Belts & BOLD Slings - Designed for Women!! 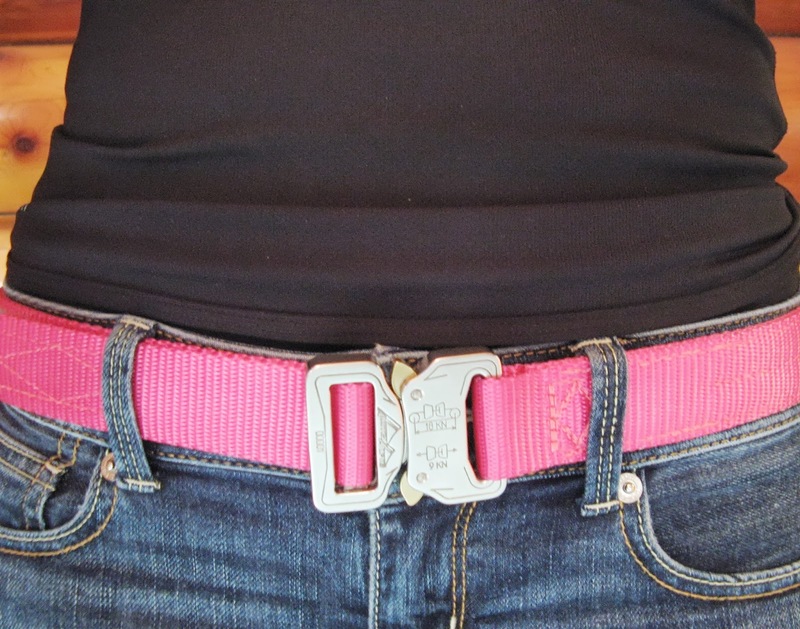 CROSSTAC Lightning Belts & BOLD Slings - Designed for Women!! ﻿﻿Crosstac is ahead of the game when it comes to creating innovative products based on what's missing from the tactical market - especially when it comes to the ladies who love their gear but want something a little brighter and more feminine. Everything Crosstac makes is 100% Made in the USA at their factory in Montana, and I love that they're creating gear that's fun, useful, and original in design. They also have some of the nicest customer service (and quickest email response times) that I've ever experienced in the firearms industry. They're really a great team of individuals, truly dedicated to helping their customers, so don't hesitate to contact them if you have any questions, concerns, or special requests. I recently got ahold of a few of their newest products, the Lightning Belt and (matching) Ambi Sling BOLD, so I'm happy to share them with you and give you a closer look. If you didn't think that belts and slings could be both fashionable and tactical, think again. Both of these products were designed with women in mind, so they are offered in a wide range of colors and a slim 1 1/4" width. 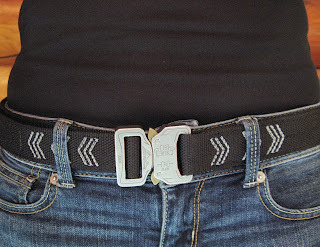 I absolutely love this belt, and it's my favorite new product from Crosstac. I think it will appeal to a great number of women, no matter what their personal style is. I tend to prefer their more casual, low-key colors that won't stand out quite as much, but if you like bright colors or a lot of flair, they've got many fun color combinations to choose from. 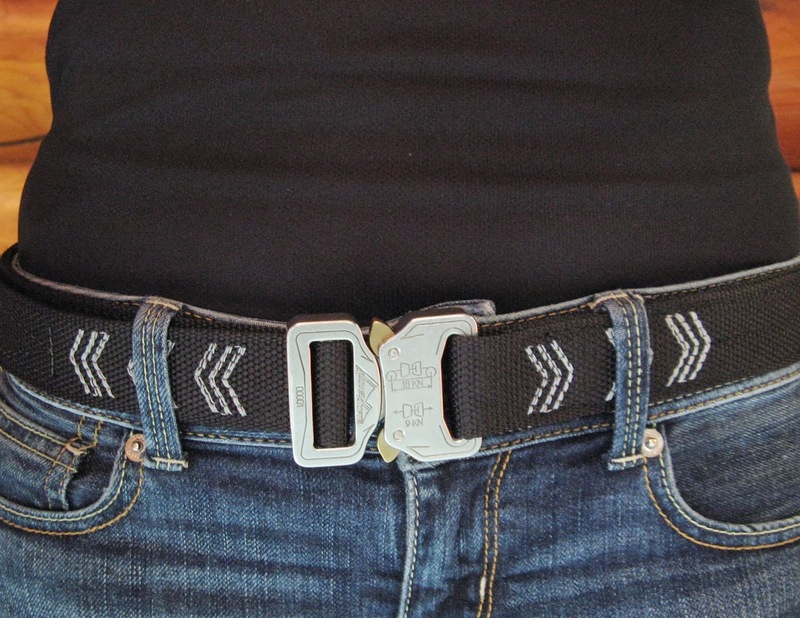 The Lightning Belt also has some really cool features, and its 1.25" width is very comfortable for a woman to wear all day long. ﻿ After personally switching to a sturdy, 1.5" leather gun belt last year, I didn't think I'd ever go back to a 1.25" belt for concealed carry (since my previous 1.25" belt was pretty flimsy) - Surprisingly, this belt has made me change my mind (as long as I get a holster with 1.25" clips so it doesn't flop around). It was constructed with an internal "stiffener" between 2 layers of soft webbing, so the belt feels sturdy while still remaining flexible. It also features a genuine Austrian COBRA buckle, which is my favorite type of buckle because it's so attractive and quick & easy to use. This particular COBRA buckle is just slightly over 1.75" tall, so it goes easily through my belt loops (and it's very easy to temporarily remove the buckle from the webbing if you need to). ﻿﻿You can select either black or silver for the buckle - The black COBRA buckle is offered on their Black and OD Green Lightning Belts (for a more tactical look), but I am really drawn to their custom Silver COBRA buckle because its so unique. As if the Lightning Belt's slender width, flexible stiffener, cool colors, and custom buckle weren't enough, it also has a hidden money slot and a hidden knife pocket that was specifically made for the popular little SOG Micron Knife. 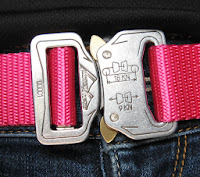 Since the hidden money slot is on the inside of the belt, near your back, it won't be easy to access while the belt's on you, but that's why you still carry your wallet :) This is just an excellent way to carry some extra cash on you in case of an emergency. To see all of their different Lightning Belt color combinations CLICK HERE! In my opinion, the hard part isn't deciding whether or not to get a Lightning Belt; it's deciding what color to get ... That's why I have two different colors (and am dreaming of a 3rd! ): I've got the "Pink (solid color) with Custom Silver COBRA buckle" and also the "Black with Storm Grey Energy Arrows and Custom Silver COBRA buckle" (both of which I will be showing in a future YouTube video, so keep an eye out for that!!). I also LOVE the OD Green with Black Energy Arrows and Black COBRA buckle, so I hope to get that one someday too, although the last thing I probably need is another belt. If you want to use it as a 2-point sling, just connect the buckle end to the rear of your rifle and the bungee end to the front of your rifle. From there, when you unhook your sling's front HK Hook or QD Connector from your rifle and go to convert to single-point, there are 2 different places you can attach it (with the buckle in between). The Crosstac Ambi Sling has a "limited bungee" feature which is really nice when you are using this as a 2-point sling. The bungee maxes out at 6-inches, and in a 2-point configuration, it gives you a little extra support and stability while shooting. This sling was actually designed to be worn over your left shoulder, with your right arm through the sling, and the bungee (in single-point) or strap (in 2-point) up near the left side of your neck. I found it fairly uncomfortable to have the bungee on my collarbone like that (since I mainly shoot using single-point), but when worn in my usual single-point manner (left arm through, sling over my right shoulder, bungee underneath my left arm), I found it to work a lot better for me personally. I just wanted to mention that because people do wear their slings differently, and also some people shoot mainly in single-point while others shoot mainly in 2-point. This sling is very versatile and ambidextrous, and it can be worn on either shoulder (although one way may feel more comfortable to you than the other). 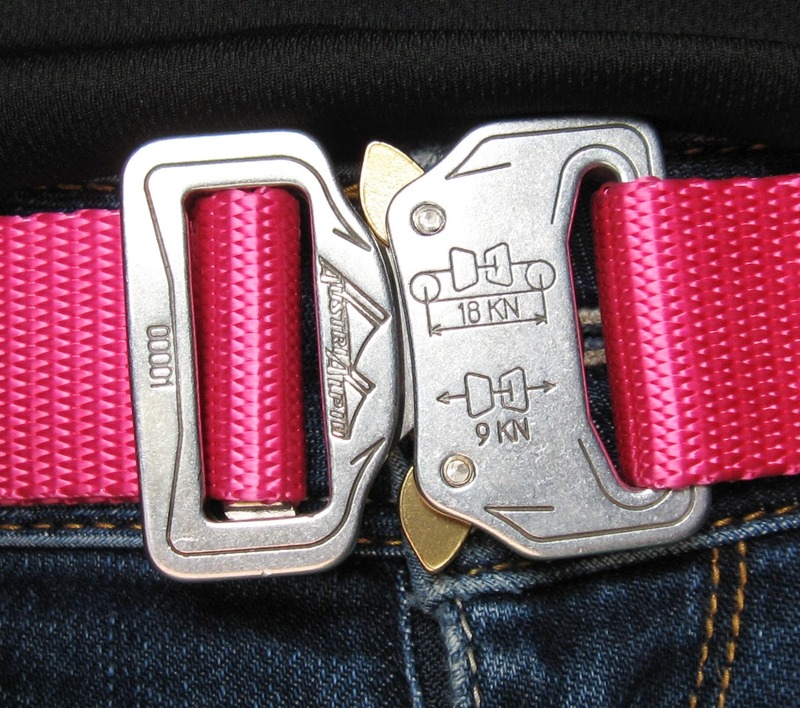 No matter which way you wear it, the buckle-end always snaps into (or hooks onto) the rear of your rifle, and the bungee part always connects either to the front of your rifle (for 2-point) or onto one of the sling's connection points next to the buckle (for single-point). The overall construction of this sling feels very durable and well made, and there are a few different options you can choose between. For sizing, they offer "Regular" (upper body sizes S-XL) or "Long" (upper body size larger than XL). For attachments, they offer HK Hooks or QD Connectors (for an extra $10). If you choose HK Hooks, you get an HK Hook on each end. If you order QD Connectors, you get a QD Connector on each end. If you're like me, and need one of each, they are more than willing to help you out and make you the exact sling that you need. Just send them a message via their contact page! My particular rifle is set up with a Noveske QD End Plate on the rear of the rifle and a Magpul RSA Sling Mount on the top of my rail, so my rifle is set up for a sling with a QD connector on the rear and an HK Hook (or Magpul MS3 clip) on the front. Depending on the types of sling mounts you have on your rifle, you might choose the standard HK Hooks or QD Connectors, or you might need to ask them to make you a sling with a an HK Hook on one end and a QD on the other. Crosstac does also offer several easy-to-install sling mounts, in case your rifle still needs a way to attach a sling (or you just want to change your setup). For connecting to the bayonet lug on your front sight post (and not using any space on your rail), they've created a unique Front Sight Picatinny Tri-Rail (with 2 HK Hook and 2 QD sling attachments) or a Front Sight Picatinny Rail (with 1 HK Hook attachment). For the rear of your rifle, they've also created a couple clamp-on mounts for your buffer tube (for either a QD or HK Hook sling attachment). If you don't have a bayonet lug, or you're just looking for a smaller, inexpensive QD sling mount for the front of your rifle, another option to check out is the Magpul RSA QD Sling Mount (which is the QD version of the RSA Mount I have on my AR-15). ﻿﻿﻿﻿If you like the design of the "Ambi Sling BOLD," but you aren't a fan of their BOLD colors, you're in luck! They do offer the exact same sling in some non-bold versions as well (Black, OD Green, or Coyote Brown, with either HK Hooks or QD Connectors). Other than its bold colors, Crosstac's "Ambi Sling BOLD" is the same as their "Ambi Sling" and "Ambi Sling QD." If you are interested in this sling but aren't a fan of the bungee, then check out their "Ambi Sling Solid" instead. Black Crosstac "Ambi Sling QD"
Overall, I prefer my Magpul MS3 QD sling because I like its original hardware, and I'm not a big fan of a bungee on my sling (since I mainly shoot using single-point). That being said, this is an exceptionally well-made sling, it works especially well for 2-point, and each shooter's style, technique, and preferences are all a little different, so it's nice that there are a lot of different options out there for slings. 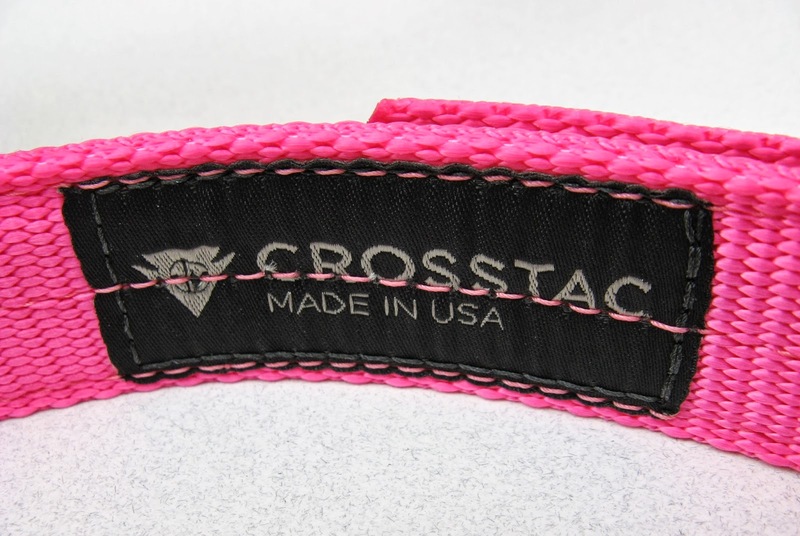 Since these Crosstac BOLD slings do also come in particularly fun colors for us women, I might still pick one up in neon pink at some point to match my neon pink Lightning Belt. The Ambi Sling BOLD (or regular Ambi Sling) is 39.99 with HK Hooks and 49.99 with QD Connectors. 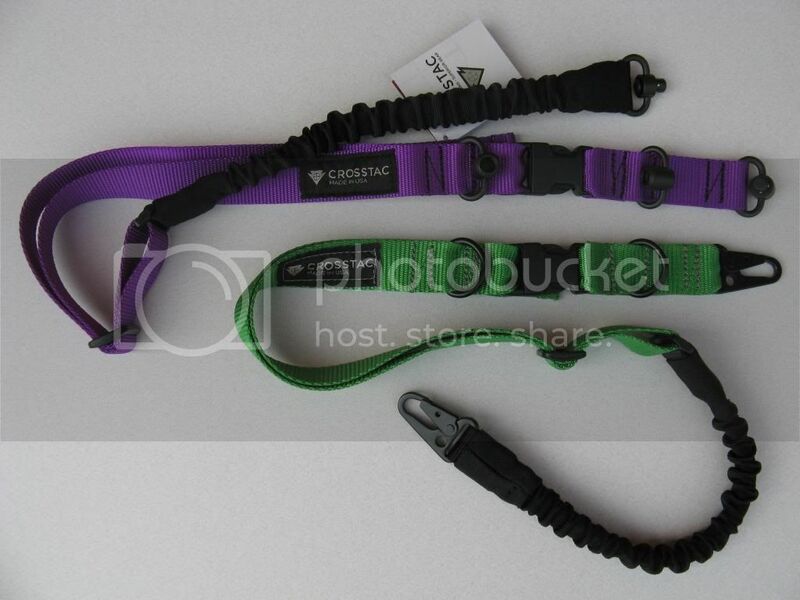 For more information on their belts, slings, and other high quality products (all 100% Made in the USA), go to http://www.crosstac.com. Definitely interested in trying the slings! I'm surprised they didn't include a bright orange for hunters, especially for the slings. Peter - thanks! They have slings and belts for the guys too. ;) It's just rare for companies to offer so many colors for the ladies! Jessica - good point! You should send them a message, I know they like to hear feedback and thoughts. I like orange too, and it would be great for hunters as you said. Just came across the lightning belt today and am IN LOVE! Great review, now I need to get the sling too, lol! Just can't decided what color to get! I look forward to your video review and of course your giveaway! La Femme - Glad you like them too. I think they are so fun, and that tiny hidden knife has already come in handy for me too. Looking forward to your video! The sling looks great, that's what I'm interested in! Loved your review. I am in the market for a sling. I was about to purchase the Magpul sling until you made me aware of this company. Count me in. Angel - These slings are great, especially if you mainly shoot in a 2-point setup. I still personally prefer my Magpul MS3 sling, though - It's pretty hard to beat. I was wondering if you could tell me what belt you were wearing in the pj holster video you did...it was a black leather one. And is it the same belt you mentioned in this post? And which belt do you prefer...the crosstac or your 1.5 leather? I dropped a small hint checked the mrs. broswer history a few days ago and badabing badabang!